With the lunation of 5 in your sixth solar house, this month you will focus on your activities and the way you handle your daily life. During this month of April it might also be about your health. You need to take care of it by getting more rest and relaxing more often. This month you are worried about your job and your health is going to feel the bad consequences of it. Don't try to push too far and get you some rest every once in a while to analyze the situation. There has to be a solution for you to slow down a notch but you define your own priorities. You appreciate being around your partner and to go out for a show. But you also enjoy playing with kids. Mercury will boost your creativity, you will use your skills as a spokesperson or as a writer in order to communicate your ideas to your audience or clientele. You may go through a rough patch at work. However it will help you work on your budget. Uranus is in dissonance and it's a complicated period with changes of situation that may destabilize you. You have to get used to new things. During the week of 7 Venus is in harmony with your decan and it will increase your magnetism. You will get along well with people, they may invite you for dinner or give you gifts and compliments. During the week of 21, the Sun is in opposition to your decan: everything will irritate you and you will feel like arguing with your partner and co-workers. Go outside and jog, you will feel better afterwards. 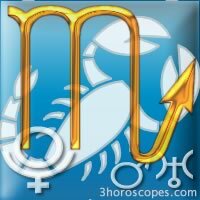 Scorpio, do you know your zodiac sign ? Do you know your planet Pluto ?